The 2014 Fulda Challenge began from Whitehorse to Dawson City (550 km), onwards to Eagle Plains (450 km), from Eagle Plains back to Dawson City and finally returning to Whitehorse. Three teams from Germany and one team each from Austria and Switzerland made up the ten participants who went head to head in the Fulda Challenge. This virtually unspoiled landscape, which is over 125,000 square kilometres larger than Germany, is home to fewer than 34,000 inhabitants. The legendary route along the Yukon Highway began in the capital city of Whitehorse, leading northwards to the former gold mining town of Dawson City, and then on to the Arctic Circle (see info box). Along the way, the five international teams, each consisting of one man and one woman, faced six gruelling competition days entailing ten disciplines – including overnight stays in a tent at freezing temperatures. Such extreme conditions required strength, stamina and mental fortitude from both the participants and their equipment. 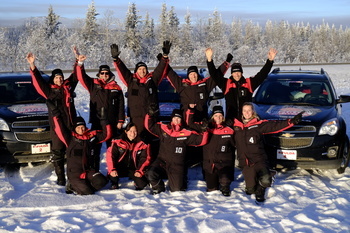 Physical resilience, team spirit, a sense of direction and driving skills on permafrost were called for. ‘Ice-cold, fascinating, breathtaking! It’s as if you are entering a different world. I can well imagine that the natives believed in nature gods, as here, the human race seems so tiny in the face of this immeasurable nature.’ Raffael Zeller is still seriously wowed. ‘Roads that lead into a never-ending expanse. The sky – so near, clear and huge. The sun, which only rises at about 10 a.m. and adopts an almost eerie presence. The ethereal polar nights. 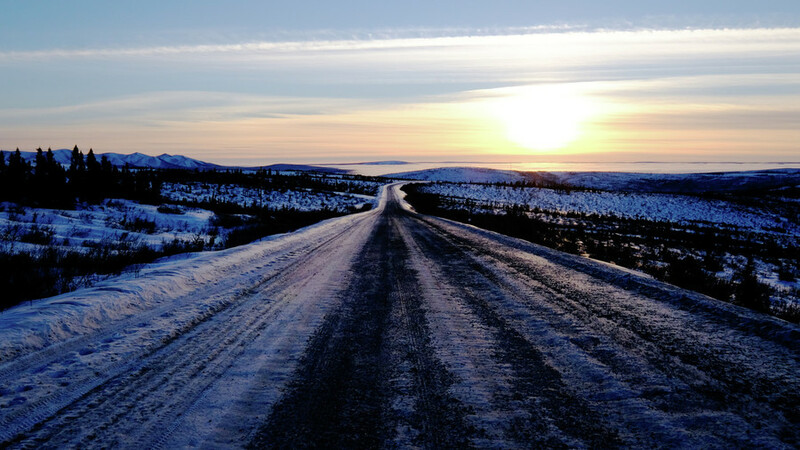 For me, one of the most awe-inspiring experiences was the 15-kilometre run along the ice-covered Dempster Highway on the 66th parallel of latitude, directly towards the Arctic Circle. Even before the start, we’d been in for a treat. The clear night meant we were witness to a rare spectacle: Aurora Borealis! 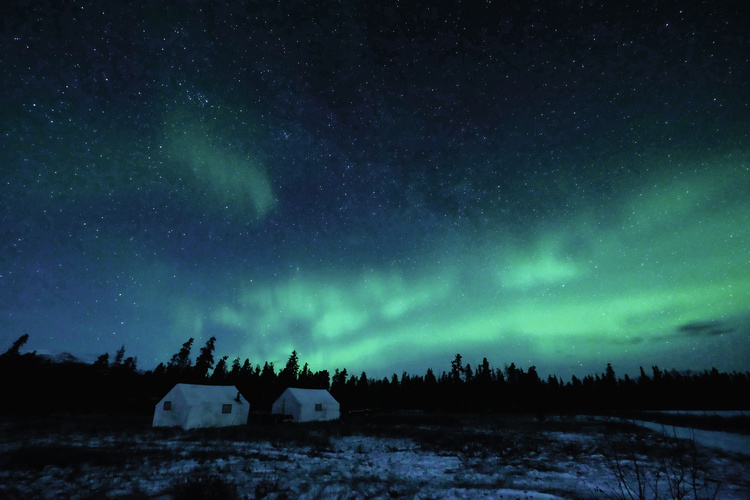 The unearthly green glow of the Northern Lights conjured magic in the night sky. The dance of the glimmering arcs left us completely speechless.’ The run was an extreme challenge for the athletes, who were closely monitored by medics. Because of the cold, ice crystals form in the lungs, which can lead to serious problems. The crowning touch to the day came when Raffael Zeller won the race. He went on to triumph in three further disciplines (quad biking, snowshoe racing and reverse driving through an obstacle course). In the end, the winners and losers were only decided in the last discipline on the sixth day. Over the 550-kilometre-long route, Raffael Zeller had used two centilitres more petrol than his opponent, which corresponds to the capacity of a shot glass. This made his disappointment all the greater. Demanding driving disciplines to be tackled in a SUV. Sporting challenges that demand top physical performance. All of this in a subarctic climate – this is what the Fulda Challenge is all about. ‘This is coupled with a strong sense of solidarity amongst the athletes, celebrities and journalists, as well as a lot of team spirit and companionship. In this respect, the Fulda Challenge has been my favourite event to date,’ states Raffael Zeller. This should not hide the fact, however, that the most exacting demands were made in terms of equipment, precision and reliability. The task ahead of the EZM 9 TESTAF was the same: extreme performance under extreme conditions. 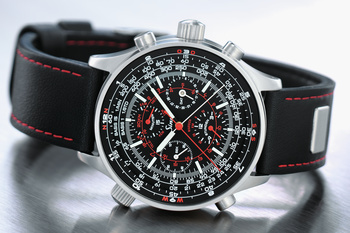 EZM 9 TESTAF: certified in accordance with the ‘Technical Standard for Pilot’s Watches’, the timepiece for professional use demonstrated reliability and top performance. Raffael Zeller wore the watch on his wrist day and night. It accompanied him through every discipline, unprotected over his jacket. ‘The EZM 9 TESTAF was my reliable assistant,’ he says, describing the function of the watch in his equipment concept. It certainly had a lot to endure. Blows, bumps and drops. Snow, ice and water, sweat and dirt. Not to mention the vibrations caused by the steering wheel during races in the snow. ‘None of this proved to be a problem,’ enthuses Raffael Zeller, firmly convinced of its mechanical sturdiness. ‘I always had an exact time indication. And the case is still in tip-top condition. Not even a scratch – nothing.’ Another challenge came in the form of the temperature changes. Often, participants had to jump out of the warm car into the bitter cold. ‘Accuracy drifts or fogging crystal is often observed on other watches in these conditions. Not with the EZM 9 TESTAF! Ar-Dehumidifying Technology and Temperature Resistance Technology proved their worth. It’s as if they were made to withstand these conditions – leaving me to concentrate on the competition. The watch never let me down.’ The EZM 9 TESTAF also demonstrated its top-quality precision in time measurement with the pilot’s bezel. The expandable folding safety clasp on the silicone strap also proved to be highly practical. Without having to remove the watch, Raffael Zeller could quickly and easily change to wearing it over his jacket. The comfort of the watch – thanks to its high-strength titanium case – was soon made clear during the sporting disciplines. ‘I didn’t notice its weight or feel that movement was limited. 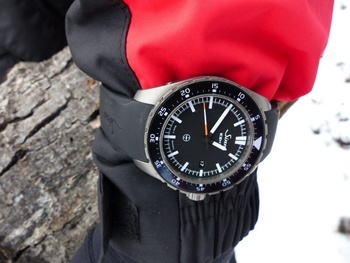 And yet, the EZM 9 TESTAF was there whenever I needed it.’ His summary: a pilot watch that works flawlessly at 10,000 metres, and also proves its functional robustness and durability on the ground – in the Fulda Challenge amidst the Canadian wilderness of the Yukon Territory. 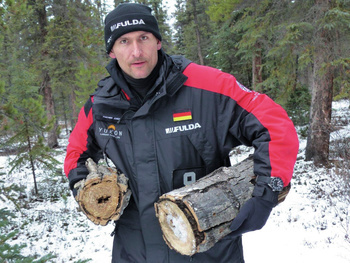 Raffael Zeller has been participating in national and international extreme sports events for over 20 years. The Fulda Challenge was his premiere. 958 FULDA The Fulda Challenge and Sinn Spezialuhren are united by a very special relationship. After all, in 2004, the Chronograph 958 was developed especially for the icy event, in a limited edition of just 250. The watch has since been sold out and is no longer available.